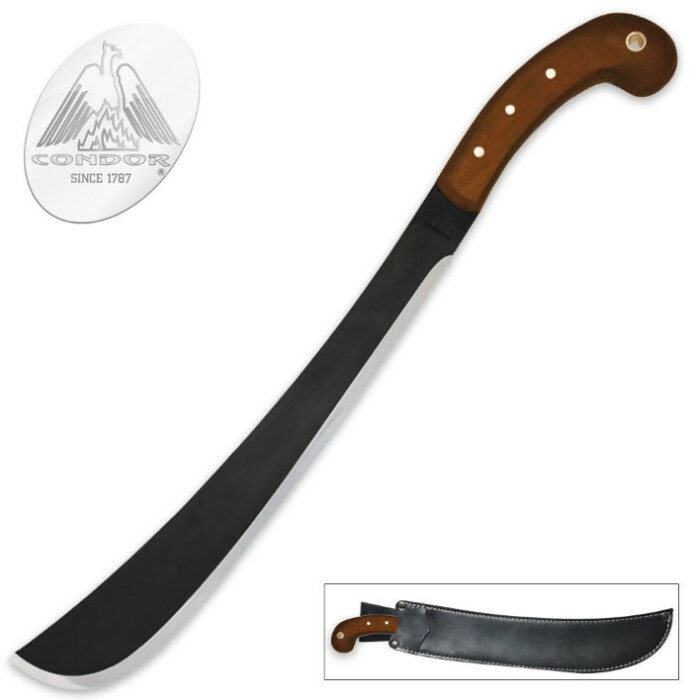 The Golok is an Indonesian design that encompasses a thick blade with a pronounced taper. The result is an outstanding combination of chopping and slicing power. 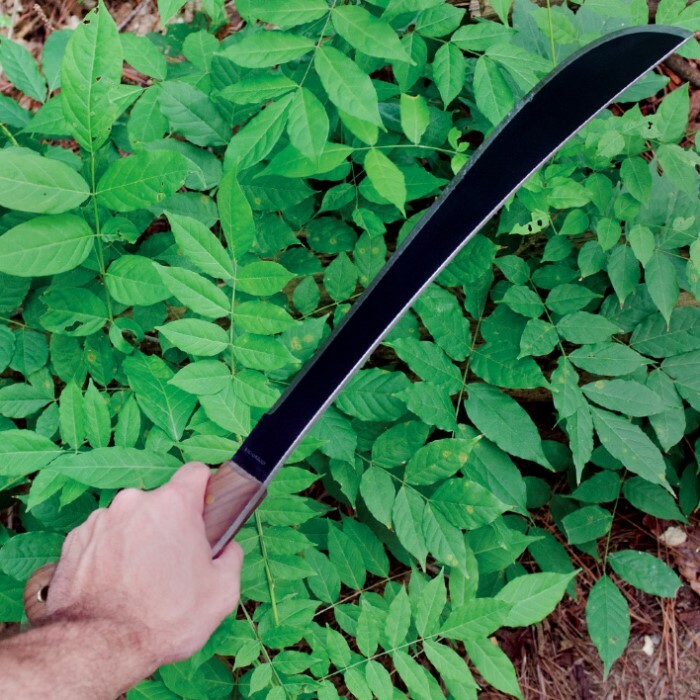 The Golok machete is heavy duty yet well balanced. 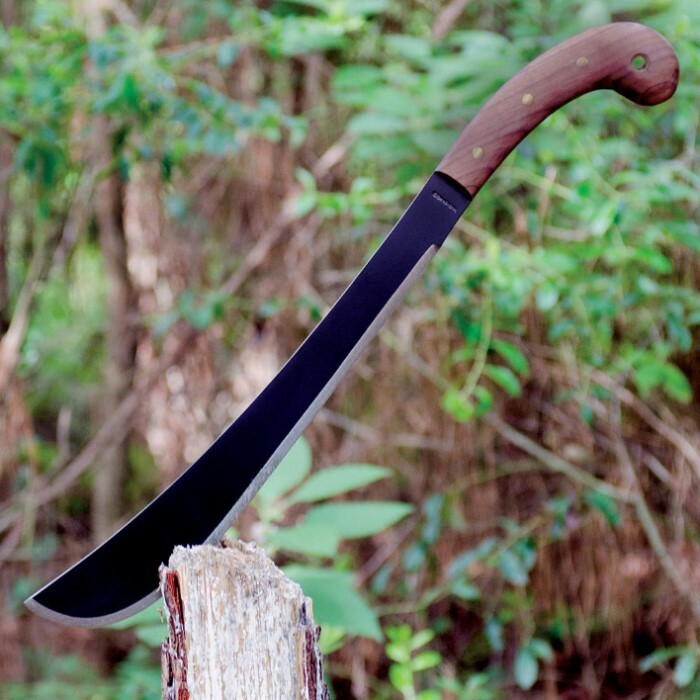 The classic blade has the chopping power of an axe with the slicing ability of a machete. 14 1/2 in. blade, 21 in. overall. This is a solid machete however it arrived dull and without a sheath. Just got this in this morning and I have to say it's quite nice. I will say that it's a tad smaller than I expected, but that in no way lessens the quality of it. I thought nothing of the shape of the handle when looking at it online, but the extra weight in the back of the handle is actually for a practical reason. Besides fitting very nicely in hand, it adds a significant amount of force to the swinging motion for both chopping and slicing, making it excellent for chopping wood or hiking through think woods. The blade is very sturdy and the sheath is very heavy duty, likely to last a long time. Although there was a little slip in the box that state that without using the proper cleaning oil for the carbon steel blade it might rust over time, so I'll need to invest in that. All said and done, after purchasing a sharpening stone and cleaning kit to keep the blade in top condition through extended use, I'd would say that this is one of the best practical use blades I own and would highly recommend it. I collect antique bladed/edged weapons and have several Indonesian goloks up to 200 years old, and if anything, the Condor golok is superior to the originals. Most of the native cultures were to some extent head hunting cultures, with the golok as much weapon as jungle knife. I purchased this one for heavy duty yard work and am sure that the literally razor sharp blade will surpass any of my needs. Keep in mind this is a high carbon steel blade just like the originals, not stainless, so rust protection is a must, but at the same time, the trade off being that it is far less brittle and less likely to break. This is by far one of the best values I've ever received from any company!! Thank you Bud K!!! This looks like a machete from Friday the 13th. This is one awesome power machete. This is a very well designed machete. Surprisingly well balanced and feels good in the hand even though blade is thicker than most. The blade weight makes for less effort when chopping. Good handle design - doesn't feel like it'll jump out of your grip under hard use. I like it. Given the serious build, should last many years. Sheath itself is very good, but needs better, stronger belt loop material. This is an awsome product. Came quickly after ordering and had good secure packaging. Been looking for one awhile and when I saw a sale it pushed my to pull the trigger, best price I could find on the internet. Looked at alot of reviews from many sites and when this arrived inspected for each complaint I had seen and very happy it passed all. Has some weight so should be a good chopper and is very comfortable in my hand. The sheath is made very well and the machete fits nice and tight. Would reccomend this as a purchase for anyone who wants a good qualiy, sturdy blade. It was also of considerable weight and I even used it to split fire wood! It came with a really good sheath too that fits into your belt. Overall 5/5 only minor thing is it could have been sharper. This is something you can treat badly for 10 years and it'll still be brilliant. Purchased two types of edged tools from budk and let me just say Condor tool is amazing. These are not toys and they are not wall hangers. What they are are military spec, forged tools or edged weapons. They are a quarter inch thick forged and what you really need for survival or bush work. They come with a high quality leather sheath with swivel and belt loop. I purchased the panga and the golok.